If you have noticed your four-legged friend slowing down as they age, this is common. Dogs, like their human counterparts, typically experience the onset of osteoarthritis, also known as degenerative joint disease. There are many preventative steps pet parents can take to slow or even sway the development of canine arthritis. Furthermore, there are treatments such as physical therapy for dogs, which can relieve pain and strengthen their soft tissues and joints. As a Top Rated Local® animal center providing care for pets in Boise, Salt Lake City, Spokane, and Billings, our team at Sun Valley Animal Center wants nothing but the best for your precious furry family members. 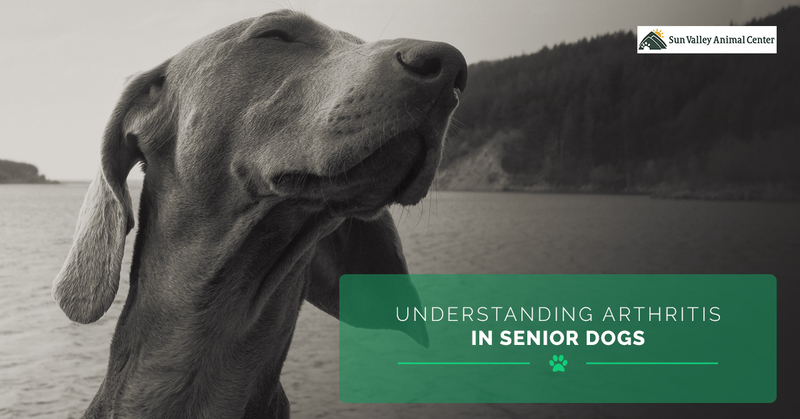 Today, we’ll explore arthritis in senior dogs, the symptoms to look out for, and the treatments that may help manage their pain and restore function. What Are the Characteristics of Arthritis in Dogs? Osteoarthritis is one of the most common types of arthritis that may affect dogs. In fact, the American College of Veterinary Surgeons (ACVS) notes that osteoarthritis affects approximately 25 percent of the canine population. Arthritis may develop over time as the result of years of wear-and-tear, an old injury that didn’t heal properly, a new injury, obesity, poor diet, metabolic disorders, and even genetics. Arthritis develops when the soft cushioning in their joints — the cartilage — and other connective and supportive tissues begin to thin and wear down. Without cartilage to cushion the joints, the bones that form the joint can rub together, causing pain, inflammation, limited movement, and restricted function. The inflammation in and around the joint and joint capsule can cause the formation of bony protrusions, called bone spurs. As with humans, any joint in a dog’s body can develop arthritis, but the most common sites include the ankles, knees, hips, lower back, shoulders, and wrists. Reduced Activity – Doesn’t play much, has difficulty exercising, running, and going up-and-down stairs. Low Energy – Gets tired easily, sleeps more than normal, lethargic, or displays slow movements. Difficulty Rising – Struggles getting up from laying down or sitting, trouble getting onto the couch, and difficulty getting into the car. Weight Gain and Changes in Diet – Has gained weight, eats less, or has little-to-no appetite. Physical Signs – Stiff movements, slow-moving, more accidents in the house. Emotional Signs – Changes in personality, appears depressed, uninterested in normal activities, irritable, spends a lot of time alone. There are many treatments, medications, natural therapies, and procedures that can manage pain, increase movement, improve function, and help them feel like themselves again. There are several medications your veterinarian may prescribe to your dog to treat pain and reduce inflammation, but these may have different side effects. Talk to your vet to see if prescription medication is the right treatment for your dog. There are also alternative therapies, such as wellness care, canine sports medicine, acupuncture, chiropractic care, laser therapy, and nutritional guidance. Additionally, physical therapy for dogs suffering from arthritis can relieve pain, improve movement, and strengthen their tissues. Finally, pet surgery is another option for pets with severe arthritis, or who may benefit from corrective surgery. Talk to our pet surgeons to see if this may be the best treatment for your dog. If you would like to schedule a vet examination for your senior dog, give us a call today. Our friendly, compassionate veterinarians can determine the right treatment plan for your furry family member based on their findings. While we proudly serve communities in Idaho, Utah, Montana, and Washington State, our renowned veterinary hospital welcomes furry friends from all over the country. Call us today to find out how we can help you optimize your pet’s health and wellness!